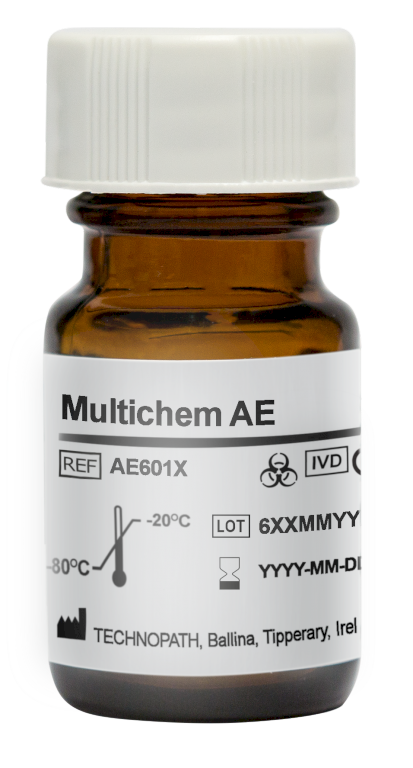 Multichem AE Control is intended for use as a third party liquid stable quality control material to monitor the precision of laboratory testing procedures for Ammonia and Ethanol Assays. The intended patient population is where a requirement has been identified for testing conditions associated with toxic levels of Ammonia and Ethanol. Ammonia, derived from the catabolism of amino acids and from the action of intestinal bacteria on dietary protein, is converted to urea in the liver hepatocytes and so rendered non-toxic. Studies have shown that excess ammonia can have a toxic effect on the central nervous system and clinical manifestations are typically neurological disturbances. Elevated ammonia may also be observed in severe liver failure, as may occur in Reye’s syndrome, viral hepatitis, or cirrhosis. Hyperammonemia occurs with genetic defects of the urea cycle and some other hereditary disorders. Therefore, elevated plasma ammonia may occur in the pediatric population. Elevated ammonia has also been reported due to administration of valproic acid. In addition to beverages, ethanol (ethyl alcohol or alcohol) can also be found in high concentrations in a variety of products such as mouth washes, colognes, candies, and medicinal preparations. When alcohol is ingested, it will permeate all tissues of the body within one hour. About 95% of the alcohol is metabolized in the liver, and the remainder is excreted unchanged. Alcohol intoxication can lead to birth defects (e.g., fetal alcohol syndrome), loss of alertness, stupor, coma, and death. Determination of ethyl alcohol concentration is commonly used for measuring legal impairment, investigating forensic evidence, diagnosing and/or treating alcohol dependency, as well as detecting alcohol poisoning. Multichem AE Control is designed as a liquid stable frozen product. The product will typically be run after reagent calibration and at a frequency dictated by laboratory QC procedures and reagent / instrument manufacturer instructions. The product should be treated the same as patient specimens and run in accordance with the instructions accompanying the instrument, kit or reagent being used. The control is to be stored at -20°C to –80°C and thawed as per IFU prior to use. The product is to be stored at 2 to 8°C between use.